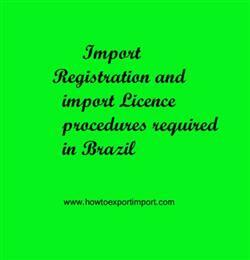 What are the procedures for registration as an importer in Brazil? How to start an import business in Brazil? How to get import licence in Brazil? What are the certification formalities to import to Brazil? How to get the status of an importer in Brazil? This post explains about import registration procedures to be obtained from Brazil government authority for importation to Brazil. Brazil Government provides maximum assistance to potential traders for promoting Export. The Ministry of Foreign Affairs (MRE’s) Department of Trade and Investment Promotion (DPR) enables companies export goods and expand business abroad. DPR’s Trade Intelligence Division (DIC), Trade Promotion Operations Division (DOC), and Investment Division (DINV) cooperate to produce commercial opportunities. Ahead of importing to Brazil, it is important to get some approvals and licenses. The first is RADAR, the Registro e Rastreamento da Atuação dos Intervenientes Aduaneiros, which is a tracking register for partners of international trade operations. It is required in order to request and acquire an import license in Brazil. After obtaining RADAR, importers must register at SISCOMEX as importers in the register known as REI or Registro de Exportadores e Importadores. In order to perform any foreign trade operation, the importer/exporter must first be registered with Secex through Siscomex. But, before being able to access Siscomex, the importer/exporter will require a Radar license - a license granted by the Receita Federal do Brazil, which is the Brazilian Federal Revenue, different from the Import License that is issued by Siscomex. This information is about import licensing procedures to import goods to Brazil. If you have to add more information about import permit and registration required to import goods to Brazil, share below your thoughts. How to get import licence in PORTOALEGRE. Procedure to get registration to import in RECIFE. Mandatory process need to complete import in RIO GRANDE. First permission required to import in RIO GRANDE DO SUL. How can I start import business SALVADOR?. Import registration procedures required in ALTAMIRA. Import Licence process in BELEM . Process to import to DEGIO SUAREZ . Requirements of registration to import to ITAJAI. Registration requirements in FORTALEZA to import. Registration needed to import to MACAPA. How can I register to import in MACAPA. How to begin import trade in SAO FRANCISCO DO SUL? Permission to initiate to import in SANTOS. The way to get registration to import in SANTOS. What Licence requited to import in MANAUS. What should I do to import goods in PARANAGUA. How to export from Saint Vincent and the Grenadines? How to export from Saint Kitts and Nevis?